A research team at Ontario Cancer Institute in Toronto, Canada have created an organic nanoparticle that they say can potentially change the way tumors are treated. Their findings appear online in the journal Nature Materials (paid subscription required). 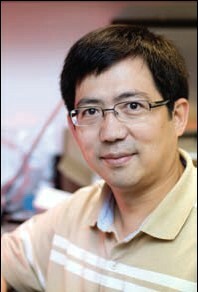 The researchers, led by the institute’s Gang Zheng (pictured left), say these new nanoscale particles — 1 nanometer = 1 billionth of a meter — are organic and biodegradable, and come with a unique and versatile structure. Among their properties are the enabling of light and heat to treat cancer and deliver drugs. Zheng explains that the team combined two naturally occurring molecules — chlorophyll and lipid — to create the nanoparticle. The nanoparticle acts like a flexible container, something like a miniature balloon, which means it can be be filled with drugs to treat a targeted tumor. These properties mean lasers can be used to treat tumors by targeting the nanoparticles that bind bound to the tumors. Doctoral candidate and team member Jonathan Lovell says the ability to absorb light makes the particles fluorescent and thus easier to target the tumors with photoacoustic technologies, which combine light and sound to create high-resolution images. The ability to absorb light also means that lasers can be used to heat and destroy the targeted tumor. As a result of their organic nature, the researchers report that the nanoparticles were biodegradable with enzymes and induced minimal acute toxicity in mice.